The year is 1914 and Britain is at war with Germany. 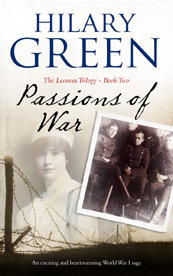 When her brother Ralph and her fiancé Tom head to the Front with the Coldstream Guards, Leonora Malham Brown must remain behind, unable to make use of her previous war-time experience tending wounded soldiers in the Balkans. But there is a deeper reason for her frustration at her forced inactivity: despite her fondness for her gentle fiancé, Leo’s heart belongs to Colonel Sasha Malkovic, the dashing Serbian officer with whom she shared a passionate romance amidst the chaos of the battlefield two years earlier. But their love can never be, for Sasha has been betrothed since childhood to a girl he barely knows. When finally she gets a chance to head to the Front with the FANY, the First Aid Nursing Yeomanry, Leo bravely confronts the dangers of war, including typhoid outbreaks and Zeppelin bombers, while never giving up hope that someday, somewhere, against all the odds, she and Sasha will be reunited. On 26th October the advance party of six FANYs, together with three qualified nurses led by the redoubtable Sister Wicks assembled on the docks at Folkestone…As they made their way towards the berth where they expected to find the Red Cross yacht which was to take them across the channel they passed a hospital ship and saw stretcher after stretcher being carried down the gangways and laid out on the dock. There, a small party of men under the command of a tall, thin colonel in the uniform of the Royal Medical Corps, were collecting them and carrying them to a waiting train. It was a miserable day, with a cold drizzle falling, but the stretcher bearers could not keep up with the growing number of casualties being unloaded from the ship. When they reached the designated berth there was no sign of the Red Cross ship. Enquiries elicited the information that it was detained in Calais because of bad weather in the Channel. The colonel was checking a list on a clipboard and looked up impatiently as the group halted and Ashley Smith saluted smartly. WHAT READERS SAID ABOUT ‘PASSIONS OF WAR’.